Brief Review of the Cat S60 – Techiance.net can only give you answers. Generally and due to the fact that they easily break if dropped or when submerged in water, tend to fritz out, most smartphones are far too fragile for a job site. This is not the case with the Cat S60, it is designed to continue functioning even after it has undergone loads of punishment. Even when completely submerged underwater, it continues working, when the screen is wet, it works normally. This is very important for our line of work being as it includes a FLIR thermal imaging camera, the first ever to offer, you named it Predator vision. You may be wondering why a heat vision camera on your phone is necessary? If you are a technician, you will find a thermal imaging camera to be very useful. A thermal imaging camera can help locate leaks in pipes, find studs behind walls, gaps in insulation as well as assist with maintaining large machinery. While at the farmer’s market, I was able to pick out the freshest cherries. I found a leak in a pipe while at work. I was able to pick out the coldest beer available. In the subway, I found the handlebar with the least amount of grod. Was able to pick out the hottest cup of Java. 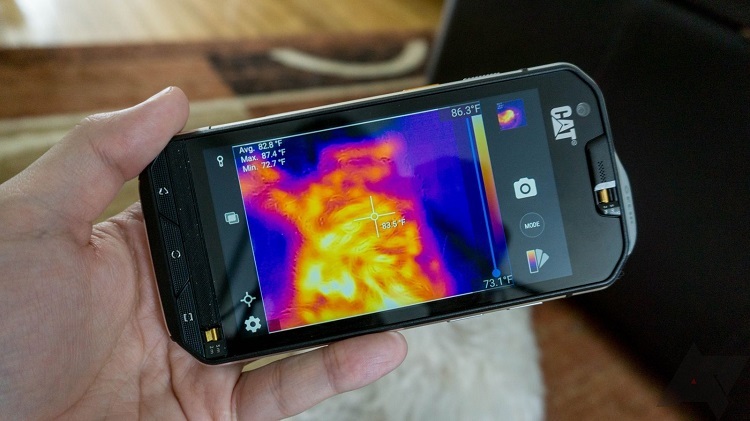 The FLIR thermal camera can be used in many, more useful ways, if you want one for personal use, there is even a small dongle ideal for your phone. If you however are someone who regularly requires heat vision it is a much better choice to have this technology directly built into your phone. If you work at a job site, you may not want to risk losing or breaking a small dongle. The dongle is jammed right into the Cat S60 which is kind of an attractive device, as far as rugged phones are concerned. Do not get confused, this is no way near an S7, it is similar to the Galaxy S7 Active however, it is much chunkier which has its own sense of charm, there is something to like about this model. In comparison to other imaging options, the reason why the Cat S60 is much more helpful is that the temperature readings are displayed in real time. An event photo or video can be taken of the thermal camera with the phone, this allows you to retroactively examine the area in question. You can also place cross-hairs on the screen with the FLIR app, this allows the temperature of different areas to be specifically measured in the same video or photo. The back of the phone comes with two cameras which allow temperatures to be shown in real time. The FLIR Lepton thermal camera combines with a regular camera, this provides a live preview. This is very beneficial due to the fact that other cameras offering thermal imaging, that tend to not only be expensive, but also offer blurry images that can be very difficult to understand. Not only are the Cat S60 cameras generally more user friendly, they also are much more intuitive. Not only does the Cat S60 offer the Predator vision, it is also very durable. The manufacturer’s claim that if dropped from six feet, it will not break, the fact that while bicycling I dropped mine and nothing more than a nick happened does support this statement, the drop would have probably shattered an iPhone so the Cat S60 proved to be quite durable. Another unique aspect is that the S60 is one of the few camera phones capable of taking photos while underwater. There was quite a bit of hype over the new series of S7 water resistant phones, these however were barely able to survive while underwater. Not only does the S60 survive underwater, it actually will function well for up to five meters. On the front of the phone, there are two switches which can be flipped to toggle the waterproofing between two and five meters, the latter will close of ports as well as speakers. When compared to the drop-friendly Samsung Galaxy S7, which was not able to survive a test by Consumer Reports done at five feet underwater, there is no contest for the Cat S60. As far as ruggedness is concerned, the Cat S60 and Active may be pretty close, but the waterproof chassis provided by the Cat S60 is far superior. The phone also excels in the OS department. In the field of phones happy with just being a sharp switchblade, the Cat S60 is a goofy Swiss Army knife. It has quite a few fun gadgets, most are not necessities to the general public. Anyone who is need of a thermal camera for their day to day use will definitely find this option very useful, who however would purchase based on being able to take photos in a pool or on FM radio? You will pay a smaller price than the Samsung Galaxy S7 Active, this device however is twice as thick and does not have the exceptional processor and screen offered by the S7. However the lack of sleekness the Cat S60 offers is made up for by its extreme ruggedness, waterproofness as well as tons of gadgets. All the problems plaguing every fragile phone on the market are solved by this model. The capability of the Cat S60 while underwater is ridiculous, it can handle a fall like no other phone out there and it offers some cool features with the FLIR thermal camera. If you are like the average smartphone consumer, the Cat D60 is not for you, however if you always have to work on homes, check gauges etc. No other phone can get the job done better then the Cat S60.